U.S. stocks ended lower Friday as concerns about the fiscal cliff continue to eclipse signs of improvement in the global economy. 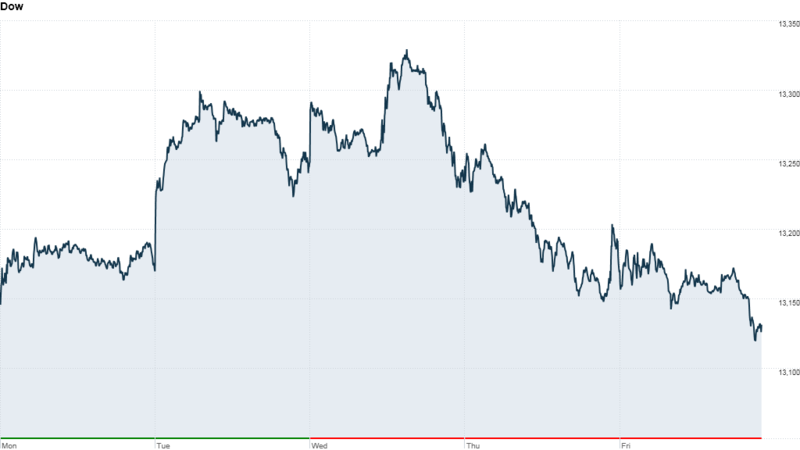 The Dow Jones industrial average fell nearly 0.3%, the S&P 500 declined 0.4%. The Nasdaq fell 0.7%, dragged lower by shares of Apple (AAPL). "There's not much going on today," said Ryan Detrick, senior technical analyst at Schaeffer's Investment Research. The market is "handcuffed" by the political standoff in Washington over spending and taxes, he added. It was a lackluster end to a mixed week. Stocks rallied Tuesday in anticipation of more stimulus measures from the Federal Reserve. But stocks ended lower Wednesday after the central bank officially unveiled widely-expected plans to buy more bonds. The selling continued Thursday and Friday, with the major gauges all ending lower for the week. The Dow, S&P 500 and Nasdaq all fell less than 0.5% for the week. Wall Street has been in a funk for weeks as President Obama and lawmakers in Congress remain locked in negotiations over tax hikes and spending cuts set to kick in automatically on Jan. 1. While many expect a last-minute compromise, the latest rhetoric from both sides suggests the talks are far from over. The muted trading Friday came despite a major rally in Chinese stocks on continued improvement in the nation's manufacturing sector and speculation Beijing will allow funds to buy more assets. The Shanghai Composite rose 4.3%, marking its biggest one-day gain since 2009. Investors also shrugged off the latest reports on the U.S. economy. The Federal Reserve reported that industrial production jumped 1.1% in November, although economists said the larger-than-expected increase was due to Hurricane Sandy. Separately, U.S. consumer prices fell 0.3% in November, the Commerce Department said. Core CPI, which excludes volatile food and gas priced, edged up 0.1% last month. The data suggest that inflation remains tame, paving the way for the Fed to maintain its stimulus policies. "The risks surrounding the fiscal cliff outweigh the rewards of good economic news," said Oliver Pursche, president of Gary Goldberg Financial Services. "It's the notion that our politicians just don't get it and are willing to play chicken with our economy." Shares of software firm Adobe Systems (ADBE) surged following quarterly earnings that beat expectations. Investors will also be watching UBS (UBS) after published reports indicated the bank faces a $1 billion Libor-related penalty. Best Buy (BBY) shares sank after the company's board agreed to extend the deadline for a takeover bid by ex-CEO and Best Buy founder Richard Schulze. 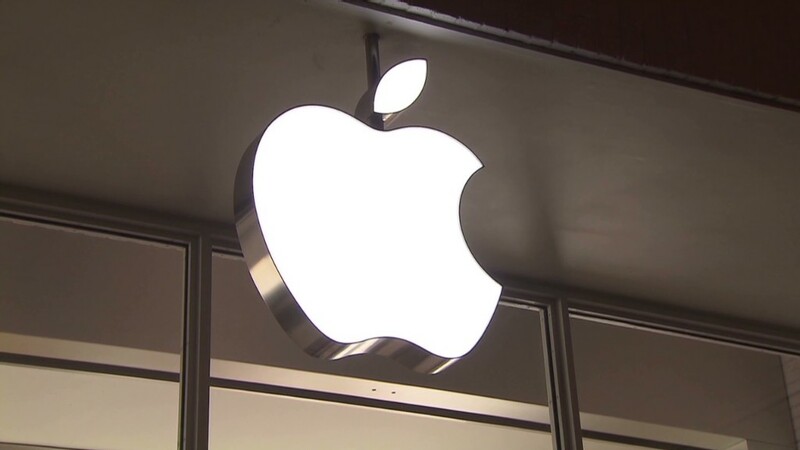 Apple shares declined after UBS lowered its 2013 earnings per share estimate for the company. Facebook (FB) shares were also in the red, as investors gear up for another lockup expiration. About 156 million shares held by Facebook employees will be released into the market. European markets ended mixed. A survey of purchasing managers in the euro area edged up to 47.3 in November from 46.5 in October, according to preliminary data from Markit. The eurozone composite PMI, which reflects activity in manufacturing and the services sector, has increased for two months in a row and stands at a 9-month high. In Asia, the Shanghai Composite was the biggest gainer. Shares in Hong Kong also advanced, but Japan's stock exchange ended lower ahead of this weekend's parliamentary elections. A new analysis by a United Nations agency stated if the U.S. falls off the cliff, some Asian countries could see growth decline by up to 2.2 percentage points, with particularly negative ramifications for export-based economies such as Singapore and Hong Kong. GDP growth in China, now the world's second largest economy, could slow by nearly one percentage point in the worst-case scenario. Oil and gold prices edged higher as the U.S. dollar fell in the currency market. Bond prices rose, with the yield on the 10-year Treasury note falling to 1.7%.